My group aims to understand how protein S-acylation (palmitoylation) acts to control protein function, with particular emphasis on its role in stress responses and development in plants. S-acylation is the post-translational addition of fatty acids to protein cysteine residues though a thioester bond. Importantly, and unlike other lipid modifications such as myristoyation, farnesylation and geranylgeranylation, S-acylation is reversible in a rapid and regulated manner. This enables S-acylation to act as a molecular switch for controlling protein function, activation state, trafficking, turnover, conformation and interaction with other proteins. A particular feature of S-acylation is its ability to increase association of proteins with membranes; every S-acyl group added provides a membrane anchoring strength equivalent to one transmembrane domain. This is very important for attaching otherwise soluble proteins to membrane. Interestingly, integral membrane proteins make up over 50% of the known S-acylated proteome indicating that membrane anchoring is not the primary role of S-acylation in many circumstances. 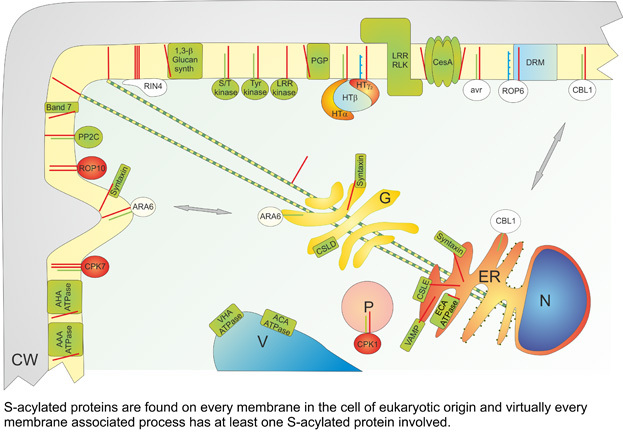 S-acylated proteins are found in every membrane bound sub-cellular compartment studied to date including the nucleus. What have we recently discovered about S-acylation? S-acylation is unusual amongst post-translational modifications as there has been no consensus sequence yet identified for modification. This has resulted in all studies on S-acylation relying on empirical data. 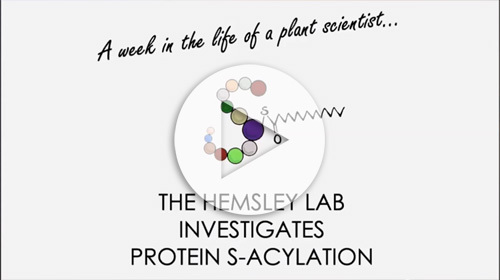 We recently published the first proteomic study of S-acylated proteins in plants (Hemsley et al. 2013. New Phytologist. 197(3):805-14) and discovered that S-acylation is much more prevalent than previously thought, affecting many diverse protein families with varied functions in plants. These proteomic data on S-acylation have recently been incorporated into the Aramemnon community database of plant membrane proteins. Our current best estimates place the number of S-acylated proteins in Arabidopsis at over 2000 indicating that S-acylation likely affects >25% of all membrane and membrane associate proteins. One of the main outcomes from the proteomics work was the identification of the cellulose synthase superfamily as major components of the S-acylated proteome. Building on this, and in collaboration with Prof. Simon Turner (Manchester), we have demonstrated that S-acylation of cellulose synthase is essential for the function of the cellulose synthase complex, with plants expressing S-acylation defective CesA subunits being unable to produce cellulose (Kumar et al. 2016. Science 353(6295):166-169). The cellulose synthase complex is made from 18 subunits, all of which are S-acylated at multiple sites. Our data indicates that the cellulose synthase complex is the most heavilly S-acylated protein complex described to date in any organism. Through our proteomics work we have found that S-acylation is a common feature of proteins involved in detecting and responding to hormones, signalling peptides, microbes and abiotic stresses. Elucidating the role of S-acylation state changes in controlling these processes is currently the main focus of the lab and is funded by the BBSRC. We are also interested in understanding the fundamental processes regulating S-acylation and de-S-acylation. We are therefore currently trying to identify the enzymes involved and define enzyme-substrate pairings using genetics, classical biochemistry, activity based protein profiling, proteomics and novel protein-protein interaction methods. Our main study organism for fundamental science is Arabidopsis thaliana, but we also increasingly use Nicotiana benthamiana as a gateway for translating our results into Solanaceous crops such as potato and tomato to improve resistance to pathogens and abiotic stress. We also work extensively with the yeast Saccharomyces cerevisiae to enable high throughput biochemistry to be performed. 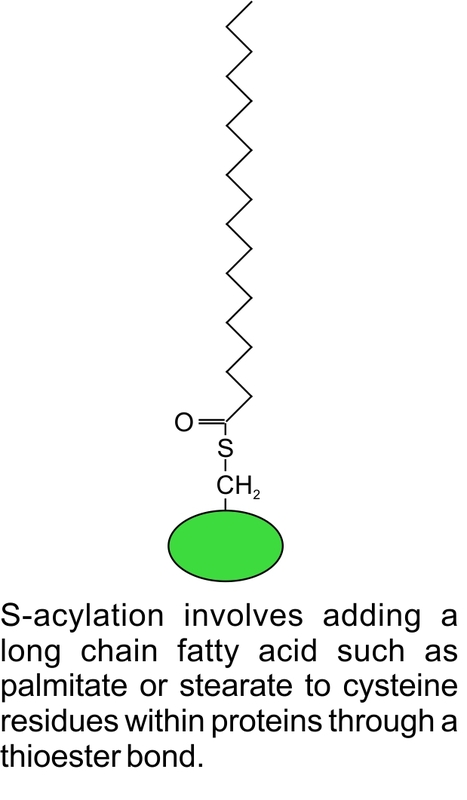 We have developed many assays for examining S-acylation in plants (Hemsley et al. 2008 Plant Methods. Jan; 4(1):2; Hemsley et al. 2013. New Phytologist. 197(3):805-14) and have made many subsequent refinements to enable faster assaying, greater accuracy of quantification and higher throughput (Hurst et al. 2017. BioTechniques 62(2):69-75). We are also more than happy to provide bench protocols for all of our S-acylation assays. How Plant Sciences can address food, energy and climate security issues. Hurst CH, Hemsley PA. (2015) Current perspective on protein S-acylation in plants: more than just a fatty anchor? J Exp Bot. 266(6):1599-606. Hemsley PA. (2015) The importance of lipid modified proteins in plants. New Phytol. 205(2):476-89. Hemsley PA, Hurst CH, Kaliyadasa E, Lamb R, Knight MR, De Cothi EA, Steele JF & Knight H. (2014). The Arabidopsis Mediator Complex Subunits MED16, MED14, and MED2 Regulate Mediator and RNA Polymerase II Recruitment to CBF-Responsive Cold-Regulated Genes. Plant Cell. 26(1):465-84. Hemsley PA, Weimar T, Lilley K, Dupree P, Grierson C. (2013) Palmitoylation in plants: New insights through proteomics. Plant Signal Behav. 8(8):e25209. Hemsley, P.A., Weimar, T., Taylor, L., Lilley, K., Dupree P. & Grierson, C.S. (2013) A proteomic approach identifies many novel palmitoylated proteins in Arabidopsis. New Phytologist.197(3):805-14. Hemsley, P.A. Identification of S-acylation of Heterotrimeric G-protein subunits in Methods in Molecular Biology; G Protein-Coupled Receptor signaling in Plants: Methods and Protocols. Ed: Running M. Humana Press, New York (2013), Vol. 1043. Wathugala D.L., Hemsley P.A., Moffat C.S., Cremelie P, Knight M.R., & Knight H. (2012) SFR6/MED16 controls defence gene expression mediated by salicylic acid and jasmonate responsive pathways. New Phytologist. 195(1):217-30. Hemsley, P.A., Grierson, C.S. (2008) Multiple roles for protein palmitoylation in plants. Trends in Plant Science. 13(6):295-302.